Senior Trey Riggs pitching against Great Bend on April 9. Him and his team will compete again on April 12 against Dodge City. The Indian baseball played at home for one half of their doubleheader with Great Bend. They won the game by forfeit due to an ineligible pitcher. 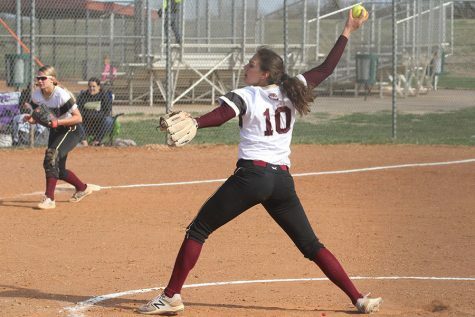 The game started out with Great Bend scoring first in the second innings, then the Indians scored one in the third and fourth, the Panthers also scored two runs in the fourth. The Indians then tied the game up in the fifth and that was when the game was called. During the game, the Indians had five hits and two errors, while the Panthers and three hits and one error. Senior Trey Riggs pitched five innings and had nine strikeouts and no walks. The Indians are 9-0 on the season and will play April 12 at home to take on Dodge City.